Goodbye to Javier, June 2007. Javier worked on Faraday waves on interfaces coated with a monolayer of nanoparticles with John Royer in the Jaeger group. He made the apparatus and saw a rich variety of wave patterns as he shook the liquid with different frequencies, amplitudes and directions. He made many movies and hopes to analyze the patterns and look for unifying themes. In his last two weeks he worked with Xiang Cheng in the Jaeger group on granular jets hitting a target look here under "German Varas". He dyed glass beads with black color and then put a small section of these black particles in the middle of a granular column consisting of white glass beads, so that he can track the motion of particles within the jet. The purpose of the experiments is to see whether the incoming velocity of the jet is the same as the outgoing velocity of the granular sheets formed after hitting and how much energy is dissipated as a function of the size of targets during the collision. He hasn't reached any solid conclusion yet. He hopes to analyze the data and come to a conclusion about the energy loss. Pictured are Xiang Cheng, Heinrich Jaeger, Tom Witten, Javier Contreras, Eric Corwin, John Royer, Thu Tranh, and program administrator Pegg Anderson. 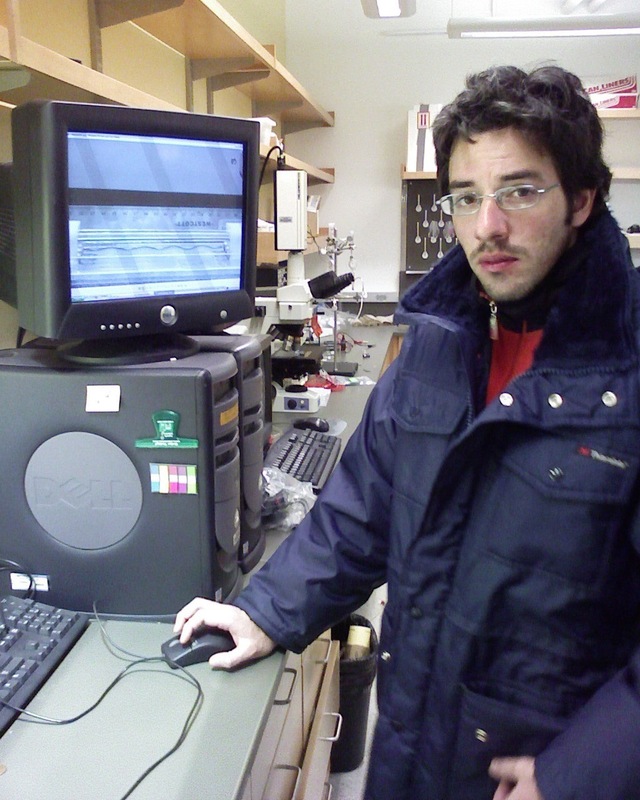 Javier Contreras Came to us on March 26, with expertise from his PhD studies in the Melo lab at USACH. 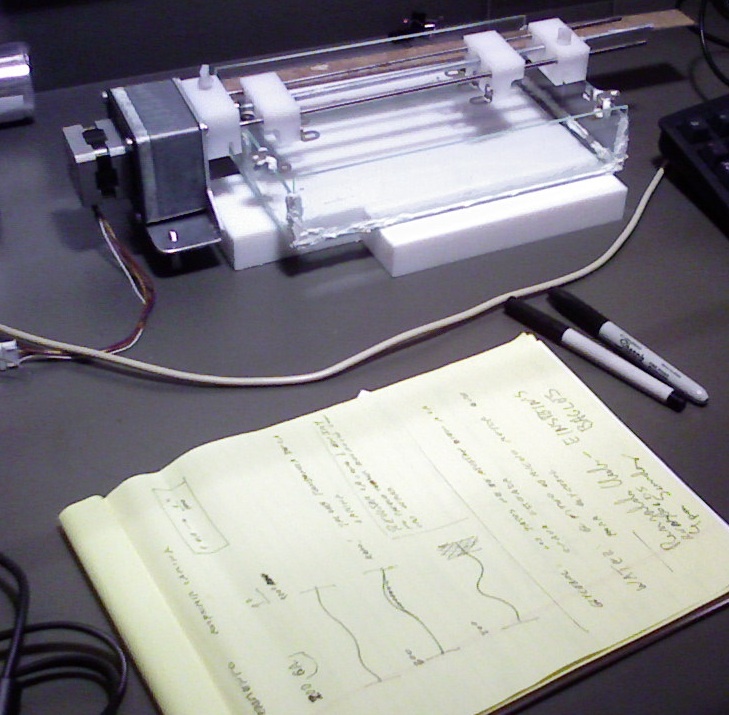 His project here in Prof. Jaeger's lab is to study capillary at a submerged surface. He is holding a plastic sample holder that he made, containing a sample well and a control well. When the wells are filled with grains and fluid, and a lid attached, the holder will be mounted on a shaker in order to excite the waves. 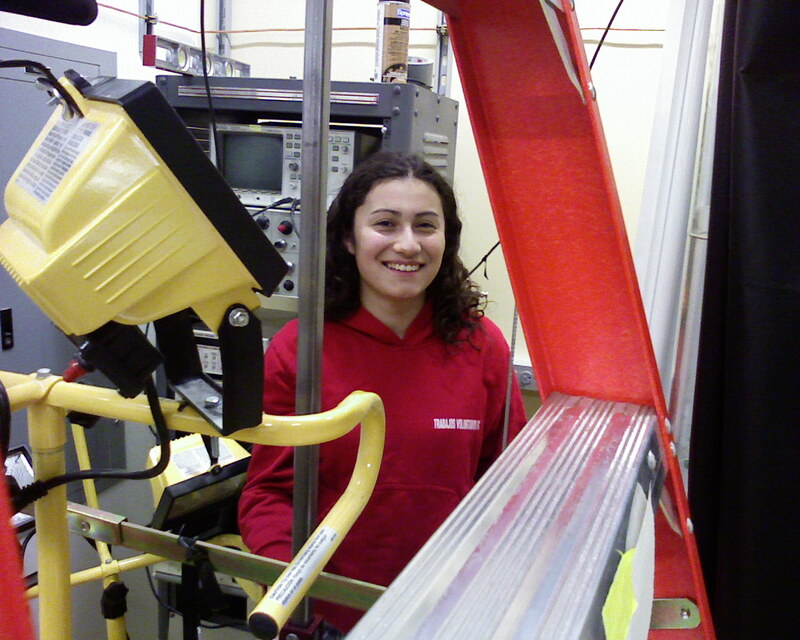 Loreto Oyarte is working on a project to measure the structure in a falling stream of sand with John Royer in Prof. Jaeger's lab. The tube enclosing the stream is half visible on the far right. To watch the structure develop, Loreto and her collaborators drop a video camera that falls along with the sand. The vertical bar crossing Loreto's right shoulder is the track for the falling camera. 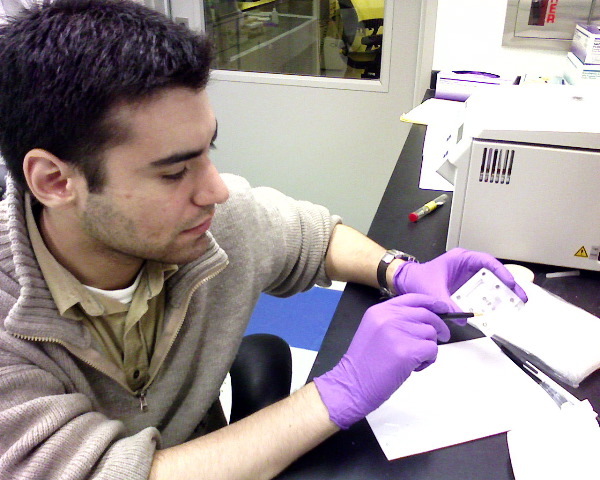 Alejandro Jara is studying droplet breakoff with Sara Case in Prof. Nagel's lab. The closeup shows his apparatus, where a drop of salty water is released from the inner chamber and falls into a reservoir. A voltage between the upper and lower chambers causes current to flow. The experiment monitors the current decreasing as the droplet pinches off from the upper reservoir. By analyzing this current, one hopes to follow the shape of the connecting thread during its last few microseconds, thereby revealing structure at smaller-than-visible scales. Sabastian Johnson will demonstrate a buckling instability of thin sheets believed to occur in monolayers of lipid surfactants at an air-water interface. He is working with Luka Pocivavsek in Prof. Lee's lab. Sebastian's project is to demonstrate the buckling at a macroscopic scale the monolayer with a plastic sheet. The video monitor at Sebastian's right shows one of the buckling patterns he saw. They will show that the wavelength has the predicted dependence on the rigidity of the sheet. 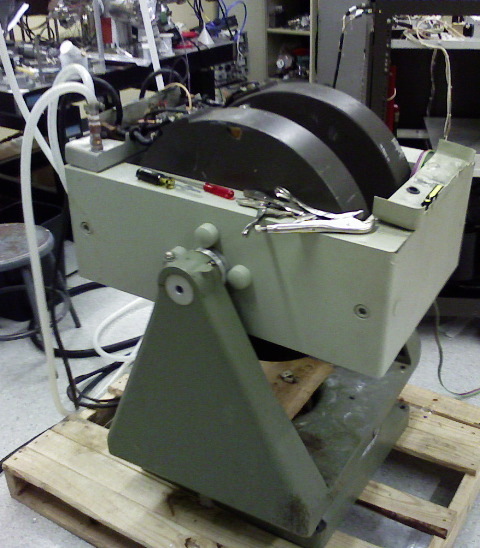 Carlos Bolvaran is building a component of a dark-matter detector with Matthew Szydagis in Prof. Collar's lab. 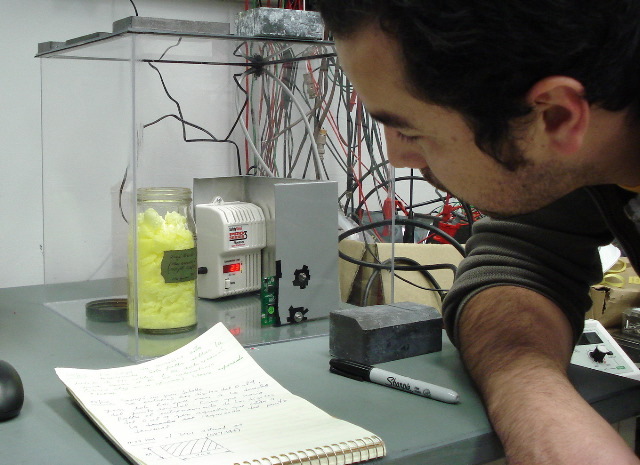 Carlos's component monitors radioactivity from radon, which can masquerade as dark matter and must thus be accounted for. The mass-market radon detector (white box with red numbers) is inexpensive, but its only output is the visual display. 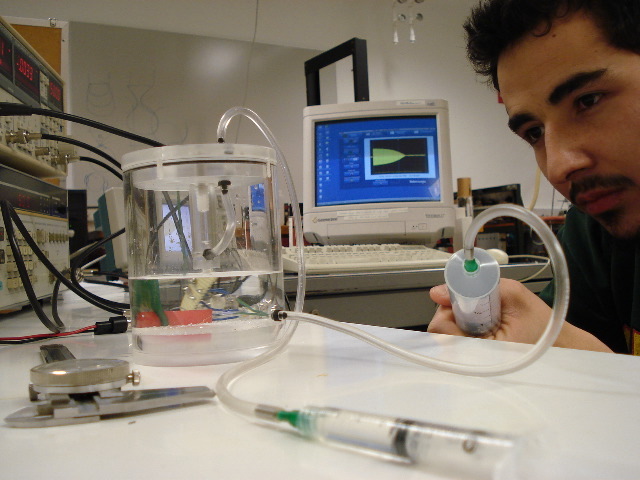 To read this output, Carlos uses a video camera connected to a computer. Image analysis software in the computer will read the digital display and record the radon levels. 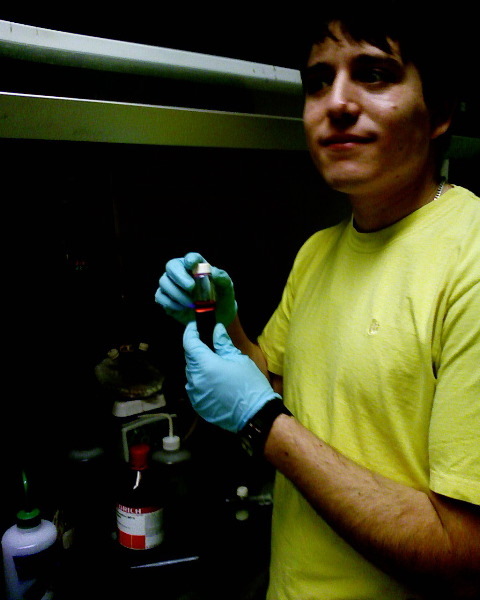 Adan Ramirez makes nanocrystals of cadmium selenide. The confined electrons in these nanocrystals produce bright and pure-colored fluorescence, as shown on the right. Adan is making films of these nanocrystals and passing electric currents through them in the laboratory of Prof. Guyot-Sionnest. The current responds strangely to magnetic field when the film is placed in the large magnet at left. Adan wants to measure the field dependence in detail. Prof. Guyot-Sionnest made plans to invite Adan to return this (Chicago) summer.